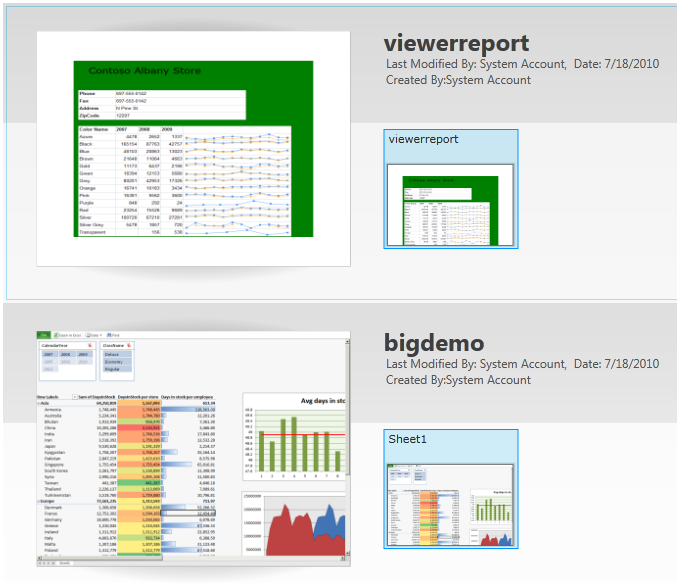 With the release of the Pivotviewer for SSRS application we finally can build our own PivotViewer app on top of our data. In this blog we are going to build an app on top of a PowerPivot sheet. I have a PowerPivot file that i use for presentations where i loaded data from the contoso database. 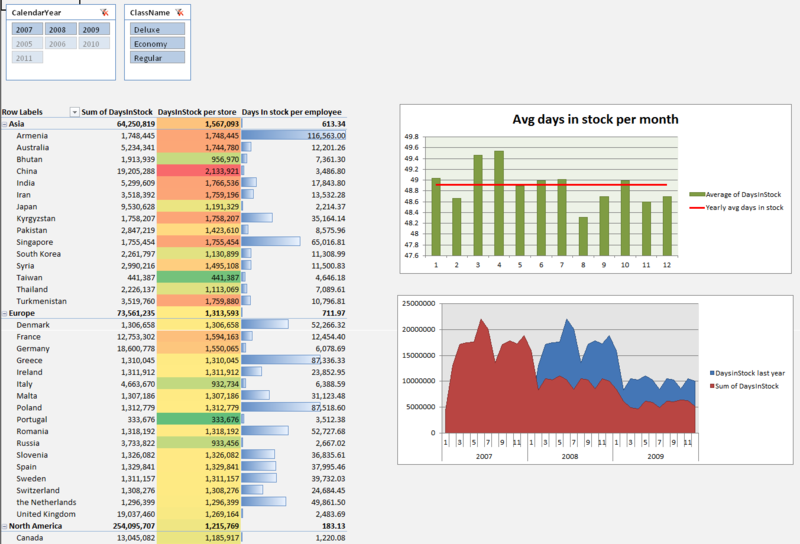 The scenario is that we use this PowerPivot application to determine which stores have little products on stock. To gain even more insight into this scenario, we want to see if there is a relationship between the stores that have little products on stock per employee. We are going to build a PivotViewer app on top of this PowerPivot file. First thing we have to do is of course install the PivotViewer Extension for Reporting Services as I described in a previous blog post. Create the images that will be the representation for each store. We create this image by using a SSRS report to be used in the PivotViewer BI Report Crawler to automatically create images for each store that will feed the PivotViewer. 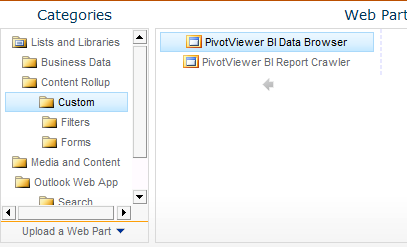 Next we have to configure the PivotViewer application using the BI Collection Administration SharePoint List. 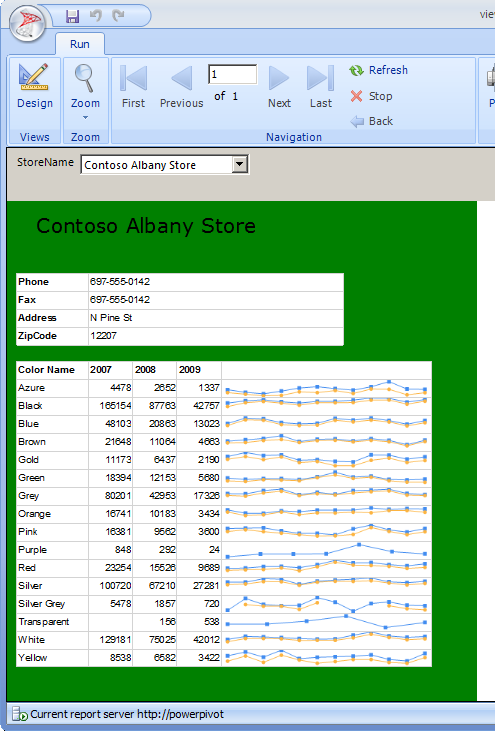 Here we configure what data will be used to navigate through the Pivotviewer data and show data for each store. 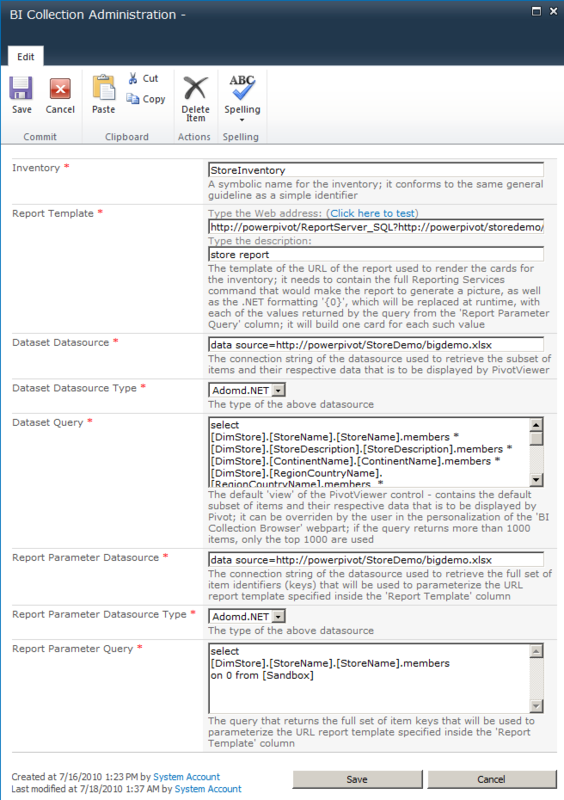 We start by creating the SSRS report. 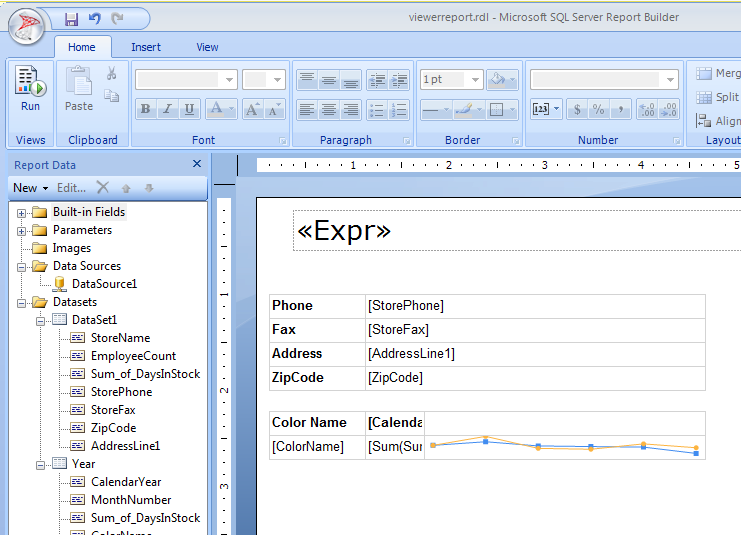 As datasource we use the PowerPivot app that is published to SharePoint. As we can see here i have created a report which gives me the details for a store. This is very important because the report will be used to generate thumbnail for each store. 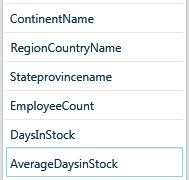 We need a parameter that can be passed through for each store, i just dragged in the Store dimension at filter part of the query designer and selected parameter. Secondly we need to remember this report will be used to show in the PivotViewer, we need to be able to identify which store this is and what the state of this store is. 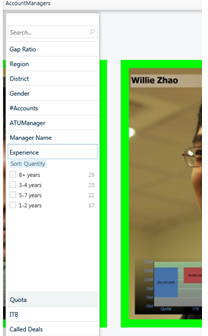 In the demo done by Amir Netz at the MS Bi Conference keynote and also at the included PivotViewer demo they have added a background color so we can quickly identify the state of the a store. Now we have to go and create the collection of items for the Pivotviewer. We have to configure the BI collection administration to create a image for each item and determine what data we want to show in the PivotViewer for each item. In Inventory we need to supply a unique name, we call it StoreInventory. And as description i used “store report”. I’m going to skip the Dataset for a second because i want to finish the report parameters. These parameters will determine what parameters are going to be passed to the report while generating a thumbnail for all the stores. 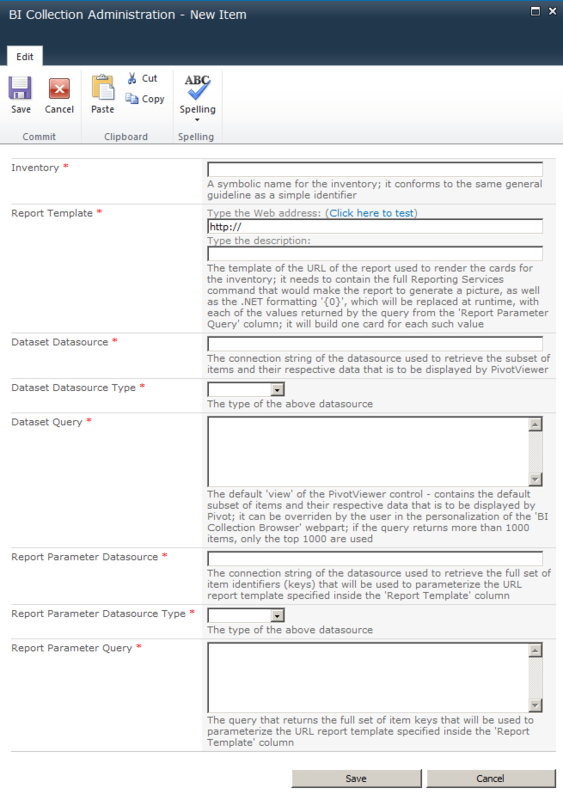 As Report Parameter Datasource we select the location to the PowerPivot file: “data source=http://powerpivot/StoreDemo/bigdemo.xlsx”. Ok now we have filled in all the properties for this PivotViewer app. I suggest you add images (perhaps store fronts?) to your report. The addition of the images is a huge cool factor. Try it. 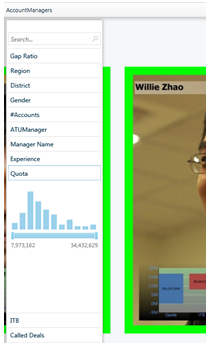 I will find some images to add to my pivotviewer demo in the near future. Excellent post! The only problem I have in implementing this is the 1000 rows limit. I understand the reason for it, but if I’m starting from a larger list, with filters to let me drill down to smaller sets, the initial load may require over 1000 rows. Is that a hard limit or something customizable? I implemented something similar in the past, but building a treemap. It could show thousands of objects, because you usually would drill into the few ‘interesting’ ones. In real life, almost all my scenarios would be of over 1000 rows. The maximum number of cards that would possibly be put on the screen is 2000 (although the inventory size of the application is virtually unlimited). If a query that specifies the subset of items from an inventory that you want on the screen would return more than 2000 items, only the first 2000 encountered would show up). This is anyway in line with best practices as displaying more than 2000 items it’s visually not helpful. You typically want to focus your analysis on a subset, anyway (like the top 1000 account managers, for example, or products etc). Anyway, in the SharePoint solution, this limit is specified in the web.config file associated with the PivotCollectionService.svc (deployed under the ISAPI folder in SharePoint). Again, this limit is NOT for the size of the inventory of an application (which could be unlimited) but for the size of the items presented on the screen at a given moment. Would like to know how we can pass multiple parameters? For example, Store and Time? Can you post a couple screen shots of this looks without the images? Thanks. Unfortunately I don’t have it running right now. Can the crawler be scheduled?